EXTERIOR: Rare and attractive color combination. The red with full length rose color top and matching rose side moldings are very unique. I\'m standing next to the car and it looks new. The paint is claimed to be all original and our inspection agrees. It has a shiny finish. No dents, garage scrapes or rust. There are only some minor touch ups you would have to look for. The chrome bumpers, mirrors and door handles still look new. The stainless trim still looks new. The door handles are not worn or pitted. The glass is all pristine. The door jambs are spotless. Weatherstrips are still soft and in excellent shape. I believe the Michelin tires are the originals, they match the spare. INTERIOR: I am very tempted to use the word perfect. As I sat in the car I could not find even a minor flaw. It\'s a very special interior that matches the exterior\'s 2 tone. It is all red with the rose inserts on the seats and door panels. The seats and armrests are glove leather. The dash area is pristine, the chrome sparkles, no cracked plastic. Not smoked in, the ashtray and lighter have not been used. The Cartier clock works, the annoying key buzzer works. The plush carpets and original mats soft it\'s two tone red with rose inserts to match are mint. It even smells new inside, no musty or mousy smells. From carpet to headliner it is like brand new! TRUNK COMPARTMENT: The trunk compartment is fully lined in gray carpet from the factory. The space saver spare was deleted, they opted for a full size spare. It is a matching Michelin tire that\'s never been used. The jack has never been used. The paint in the jamb and bottom of trunk lid is pristine, still has paint ok stamp. The trunk light works. The rubber, latches, decal is excellent. 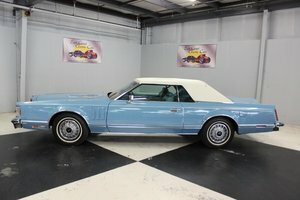 These ultra low mile Cadillac\'s and Lincolns from the mid to late 70s are very desirable. A Mark V is at top of the list and this one is a prime example!